"It is strange how so many states have passed human rights legislation to force store owners, professional photographers, etc. to treat others decently and to follow the Golden Rule that Jesus cited. Meanwhile, Mississippi -- the most religious state in the U.S. -- passed legislation to allow store owners, professional photographers, etc. to treat potential customers like sub-humans while citing their religious beliefs as a defense. Mitchell Moore, who owns Campbell's Bakery in Fondren, MS, decided to respond in a positive way to Mississippi's new "Religious Freedom Restoration Act." 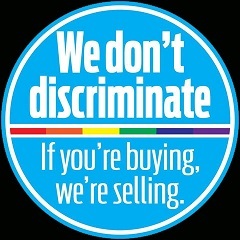 He created this design for a window sticker that store owners who oppose discrimination can place on their store window. Hundreds of business in Mississippi are attaching the stickers in prominent places. If any other state passes a "license to discriminate" law like the one in MIssissippi, it is quite probable that similar window stickers will appear in businesses throughout their state as well. "Although ... [Governor Phil Bryant] still maintains that the bill does not open doors to potential discrimination, he invited religious leaders, and anti-gay leader Tony Perkins of the Family Research Council to a private bill signing ceremony for the Mississippi Religious Freedom Restoration Act. ..."
"[The Act] requires that 'state action shall not burden a person’s right to the exercise of religion' by compelling 'any action contrary to a person’s exercise of religion.' The bill defines 'exercise of religion' to mean 'the ability to act in a manner that is substantially motivated by one’s sincerely held religious belief, whether or not the exercise is compulsory or central to a larger system of religious belief'." "This means that a business could legally discriminate against people if it claims that such discrimination is motivated by their 'sincerely held religious belief.' This bill legitimizes discrimination and segregation in Mississippi state law." The petition received 4,387 supporters. Copyright © 2014 & 2016 by Ontario Consultants on Religious Tolerance.